Group Hope is a program of the Mental Health Association of Rock Valley (MHARRV). In addition, Group Hope is associated with Mental Health America (MHA) and affiliated as a local chapter of the national DBSA. 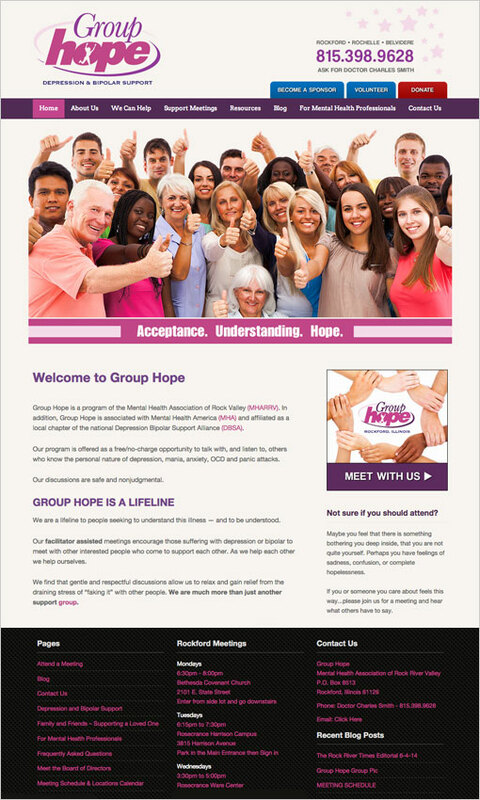 When approached to re-design Group Hope’s website, the client had 2 major requirements in mind. Number one… Develop a mental health website that would encourage and make it easy for those in need to attend a meeting. Number two… To create awareness of Group Hope throughout Winnebago county and surrounding areas. Mental Health Web Design | Physician Website Design.